We are an artisan bakery within walking distance from the Sydney CBD where we have been baking fresh breads and pastries every day for nearly a decade. 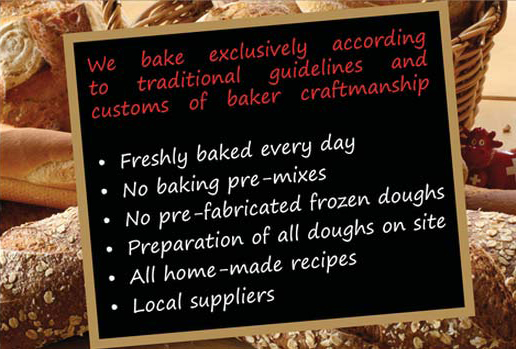 All of our food is produced on-site by our highly experienced team of international bakers and chefs using only the freshest ingredients available, sourced locally whenever possible. Besides our bakery range we also offer an exquisite breakfast and lunch menu as well as an extensive range of tasty sandwiches made with our own bread rolls. We serve our own coffee, a delightfully smooth blend, roasted according to our strict specifications. You can grab all this to take away or if you find a spot, sit down and relax for a while. We also supply a range of cafes and corporate clients for a wide range of occasions.